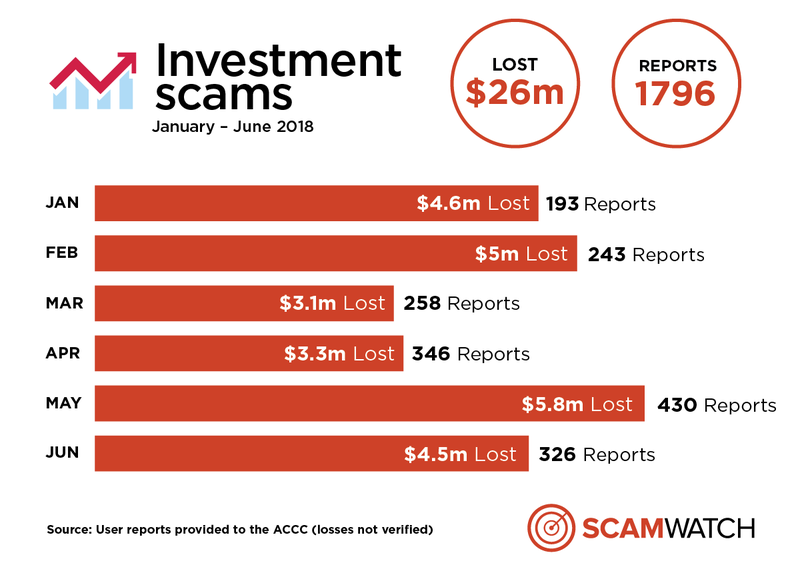 In 2018, more than $26 million has been reported lost to investment scams—already 84 per cent of the total losses recorded in 2017. This represents an average month on month increase in losses of 117 per cent compared to last year. “These scams are very sophisticated and the scammers are very convincing. People aged 45–64 are most at risk and make up more than half the reports sent to Scamwatch," Ms Rickard said. The vast majority of investment scams are still centred on traditional investment markets like stocks, real estate or commodities. For example, scammers will cold call victims claiming to be a stock broker or investment portfolio manager and offer a ‘hot tip’ or inside information on a stock or asset that is supposedly about to go up significantly in value. They will claim what they are offering is low-risk and will provide quick and high returns. “Scammers will spend significant time and effort grooming their victims to invest. They will use the right technical language and also offer professional looking websites and documents to convince victims they are legitimate. It’s often only when people try to cash out their investment that they realise their money is gone,” Ms Rickard said. Two other types of investments where scams are prevalent are cryptocurrency trading and binary options. Cryptocurrency trading scams have grown significantly in the past 12 months and are now the second most common type of investment scam offer pushed on victims. “The rise in popularity in cryptocurrency trading has not been missed by scammers who are latching onto this new trend to con people. These are similar to any other investment scam: the scammer will claim to have inside knowledge about price movements they will use to make you a fortune. If you invest, your money will quickly disappear,” Ms Rickard said. The clearest warning sign you’re dealing an investment scammer is how they contact you and the promises they make. “It can be very difficult to tell what is and isn’t legitimate these days. If someone calls, emails or texts you out of the blue with investment advice, don’t engage with them no matter how legitimate they sound. Hang up the phone, or delete the email or text. If you’re searching for new investment opportunities online, don’t always trust what you read. It’s easy for scammers to create professional looking investment websites,” Ms Rickard said. “If you are keen to invest, start by visiting ASIC’s MoneySmart website. This a fantastic resource that explains the steps you should take before committing to an investment and how to avoid scammers. Always check ASIC’s list of companies you should not deal with before you invest,” Ms Rickard said. You can report investment scams to ASIC or Scamwatch. Follow @scamwatch_gov on Twitter and subscribe to Scamwatch radar alerts to keep up to date with advice for avoiding the latest scams affecting the community.